life in ministry, in marriage, in pursuit of holiness. I have been living my calling for as long as I can remember, but I’m only now saying ‘YES’ to that call. It was those words I began to share my call to pastoral ministry with the Annual Conference. * I have been a leader in church ministries from the time I was a young girl. Heading off to college, I knew I would continue to be involved in ministry, but I didn’t know in what capacity. I didn’t think I wanted to be a “professional” or a “working woman” (so why in the world was I going to college anyways? ), nor did I believe that woman should serve as pastors. I was so strong in this stance, in fact, that I once wrote a paper against the idea of women in lead pastoral ministry. My professor, also a mentor of mine, wrote a page long rebuttal and continued to prod me into my calling with every course and conversation. Many other men and women have joined in the efforts of gently and lovingly calling out my gifts and graces for ministry, some of them so subtly that I found myself agreeing without realizing it. I became the youth pastor at Monroe Free Methodist Church in 2008, but preferred to ignore the “pastor” part of the job title for fear of its implications. I continued in volunteer ministries during our time in Albion (NY), stepping up as a worship leader and youth leader. I have served as a youth camp speaker on multiple occasions and have taught and prayed and led from behind the microphone countless times. But I was afraid. Not of addressing the crowd or holding a microphone in my hand or praying in front of people. No, I’m thankful that those tasks come naturally to me. I was afraid of the implications of “preaching” and “pastor.” If I said “yes” to either of those calls it would be stepping out of safety, making the decision to “paint with bold colors” rather than the pastels I’d been using, sticking out in ways I’d rather not. I’ve preferred to stay behind my husband, the pastor, rather than beside him. He’s the pastor, I’m just the worship leader. Sure, some Sundays I get to preaching in my worship leading and I sit down as he stands up and mouth the words, “Sorry, I took all of your sermon time.” But nooo, I’m not called to preach. I’m not supposed to pastor. I’ll just stand over here in the shadows not making any waves, thankyouverymuch. So I took the FM History and Polity course. I loved it, loved studying the Book of Discipline and learning the reasons behind why we operate as we do. It solidified my love of the Free Methodist denomination. I completed a year and a half as a Local Ministerial Candidate, having been confirmed by my local church as gifted for pastoral ministry. (Note that this was about a year before I confirmed my call to be a pastor.) The MEG board (Ministerial Education and Guidance Board) “vetted” me and voted on my acceptance as a Conference Ministerial Candidate and then last Thursday the Annual Conference voted to receive the MEG board’s recommendation that I be admitted as a CMC. 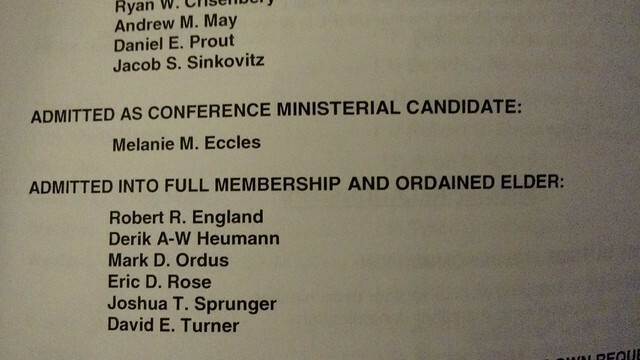 The MAC (Ministerial Appointments Committee) also voted to appoint me to Monroe Free Methodist Church, meaning I am now actually and officially a pastor! 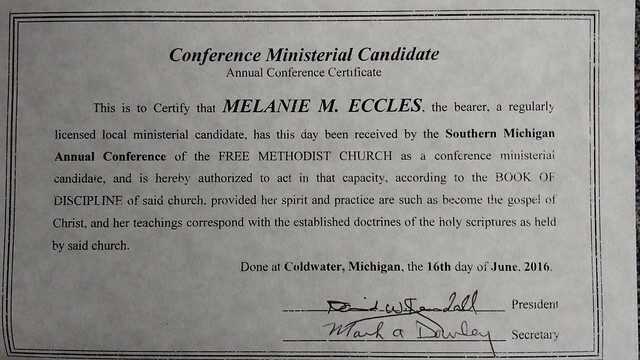 Process-wise, I will serve three years in full time ministry and complete any education requirements the MEG deems necessary, and prayerfully in 2019, I will become an ordained Elder, which is the final step in ordination in the Free Methodist Church. This Sunday I will be preaching my first “official” sermon as Associate Pastor of Monroe FMC. Not much else will change in the ways Kevin and I function; like I said, I was doing the work of a pastor before I said “yes” to being a pastor. But I feel different. I feel more alive. I feel appointed and called and in the center of God’s will for my life. And so it was with me, brothers and sisters. When I came to you, I did not come with eloquence or human wisdom as I proclaimed to you the testimony about God. 2 For I resolved to know nothing while I was with you except Jesus Christ and him crucified. 3 I came to you in weakness with great fear and trembling. 4 My message and my preaching were not with wise and persuasive words, but with a demonstration of the Spirit’s power, 5 so that your faith might not rest on human wisdom, but on God’s power. For more information on the Free Methodist Church’s stance on Women in Ministry click HERE. Melanie, Thank you so much for sharing this. My views about the ordination of women have changed very much over the years, also thanks to some wise and gracious professors at SAU and my own research and reflection. We currently attend a church that doesn’t allow for women to be ordained and it is becoming increasingly difficult for me to stay there. Seeing how much freedom and life this move has given you–and the gift that you are to your church–brings tears to my eyes. I hate to see my church (and so many other good churches) denying themselves that gift. Awesome! I began reading your posts around 2008 and we even exchanged emails a few times. I love hearing how God has called you to serve as a pastor! Awesome! I remember you, Andrea! Thanks so much for commenting and for your encouragement and prayer!